Juggling entrepreneurship and parenthood is not an easy feat. For Genalyn Socorro, owner of Gen Sweet Tarts, entering the arena of entrepreneurship is her way to give more quality time to her child. “I wanted to build my own business so I can take care of my child,” she shares. With the help of her previous work experience, she’s been able to build Gen Sweet Tarts and now owns a house and has freedom to manage her own time. Her business journey hasn’t been smooth sailing, but with determination and hard work, she has found success. 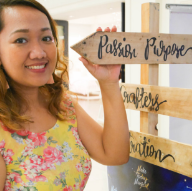 In conversation with GlobalLinker (GL), Genalyn Socorro (Genalyn) shares her business journey. Genalyn: My drive to have a business started when my husband and I worked in a Pasalubong Center. When we were working there, I noticed that I was neglecting my child due to the long work hours. I thought of building my own business, so that I could devote more time taking care of my child. That’s when I started to read magazines about business. We were able to save Php70, 000 while we’re working before. Since we used to work in a Pasalubong Center, we thought of building a similar business. I knew there’s a profit to be made, so we built the same kind of business. But that was a mistake. After three months, our store was already closed because we immediately rented a space for our store. Genalyn: One of our challenges was when our store closed. I thought it was the end of our business. But our business became better because we now work at home. We’re no longer renting a space and we’re just delivering our products. Genalyn: Our unique selling proposition is that our products are delicious and affordable. packaging with the help of DTI. Genalyn: UnionBank GlobalLinker helps us in networking our business because many people get to know our product. It also widens our knowledge that will help in growing our business as more people will give us advice and buy our products. Genalyn: My message for those who want to have a business is to be hardworking, to be persistent, and to not stop dreaming. Always pray and ask for guidance and strength because there are a lot of challenges in business. Think of your reasons why you are doing your business. For me, it’s for my child and my family. You can help them, even more, when your business is successful because you are earning and you’re also providing jobs. Network with Genalyn Socorro by clicking on the 'Invite' on her profile.